The UI Custom CSS block allows you to alter the CSS code used in your course site. Note that you will need a familiarity with CSS code to use this block. Add the UI Custom CSS block. See our Using Blocks page for instructions on how to add a block. When you first add the UI Custom CSS block, it will be blank. 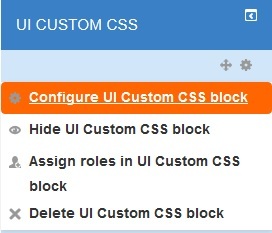 Click on the gear icon underneath the name of the block and choose Configure UI Custom CSS block. If you would like to use an external stylesheet, enter the secure stylesheet URL in the "CSS Stylesheet URL" text box. Enter additional CSS Code in the "CSS Code" text box.